Mexican president Enrique Pena Nieto last Friday presented his commander of Mexico's land and air forces, General Salvador Cienfuegos Zepeda, replacing outgoing Secretaria de Defensa Nacional (SEDENA) General Guillermo Galvan Galvan, according to Mexican news reports and official government sources. General Cienfuegos Zepeda was elevated as head of the Mexican Army after his appointment to the post of Controller and Inspector of Mexican Air and Armed Forces last January, passing over two other top staff generals. According to several news accounts, General Cienfuegos Zepeda has held several field commands during his career, which began January, 1964. He is a graduate of Mexico's Heroico Colegio Militar military academy, and holds a masters degree in Military Administration for national security and defense from Colegio de Defensa Nacional. He also attended staff and command courses at Escuela Superior de Guerra. Public accounts of General Cienfuegos Zepeda indicates an infantry commander who tended to be low key throughout his career in various infantry unit commands. Most of his experience is in military region and military zone commands in western and southern Mexico including Jalisco, Guerrero and Michoacan states. 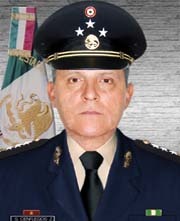 His last regional command before taking the post as controller and inspector of the army was in Chiapas, the Mexican VII Military region, relieving General Cuauhtemoc Perez Antunez in April, 2011. He came to that post from Military Region I in Distrito Federal. One of the hallmarks of a Mexican commander being groomed for taking the top job are holding posts as military and air attache at foreign embassies. General Cienfuegos Zepeda was military attache to the embassies of Japan and Korea. Little public information is available about General Cienfuegos Zepeda in his personal life. It is known in Mexican press that he has been friends with Pena Nieto for quite some time. A recent tradition of allowing the incoming SEDENA to lead the Mexican Army during the Revolution Day parade was broken a second time this passed Revolution Day. This writer watched the parade and not only did General Cienfuegos Zepeda not lead the parade, his name was also not even mentioned by any press accounts. The tradition dates back to the inauguration of Miguel de la Madrid Hurtado in 1982, but was broken starting with the election of former president Felipe Calderon Hinojosa in 2006, when General Galvan Galvan was appointed SEDENA despite General Juan Alfredo Oropeza Garnica having lead the 2006 Revolution Day parade. General Oropeza Garnica was a dynamic frontline commander and counterinsurgency expert who fought leftists insurgents in Guerrero state, even becoming wounded in 1997 while he was commander of the 27th Military Zone. General Oropeza Garnica was snubbed however because of his operation in El Charco in Guerrero state in 1998, where 11 insurgents were killed and another five were wounded in an early dawn ambush. Leftist and human rights groups claimed the 11 dead were unarmed, but later investigations showed the group was armed. 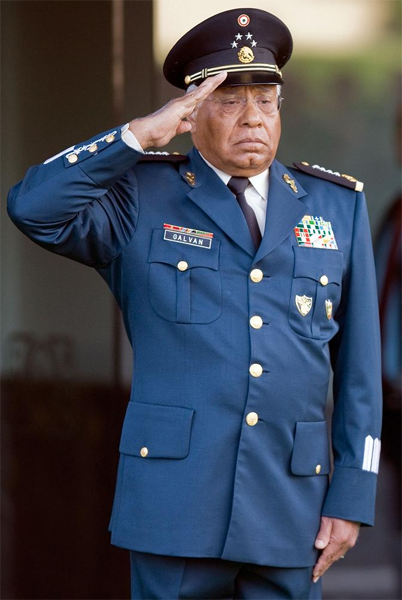 Every indication from press accounts in 2006 indicated the elevation of General Galvan Galvan to SEDENA was a compromise choice meant to quell opposition from Mexico's left after the Calderon's razor thin win. The choice of General Galvan Galvan was notable because he was an artillery commander throughout his career, unlike his predecessors. According to a column in El Universal dated November 1st, 2006 by journalist Raymundo Riva Palacio, General Cienfuegos Zepeda was a commander who was being considered for the top spot, while he was commander of IX Military Region in Guerrero, but had very little field command experience to that point. 11 armed insurgents were killed? FALSE. Oropeza is responsible of what we have called ever since "la masacre de El Charco". El Charco where 11 people were assesinated in a school. Some of the unnarmed, in their knees with their hands on the air were executed. 22 were arrested an tortured. Only 2 were detained and charged. As susrvivor dennounced to CIDH. Perhaps the general will be able too further corporate control of the drug market. Have serious doubts where this guys loyality lies. Is he connected to any cartes? His rise to power seems shady. Anyone witb concrete info. Please share. It'd be a great start if he's not owned by a shady government or cartel. Prayers to Mexico. This new general looks 100 years old. Not a good choice. Old school PRI is alive and well. "Just what mexico need someone who looks like silent of the lambs"
The custom in Mexico is the take the muzzle off during the profile pics. Otherwise, nice observation. Look at the kipper on this guy! He looks like he's chewing a wasp .